There is always a desperation in the call for help but when it is your own mother you can hear the unspoken words, the anguish in seeing her beloved little dog so painful she would bite in opposition to handling. Abby is a senior Dachshund and had fallen from the couch earlier that week and had been a bit sore. I recommended some pain meds and rest. With a Dachshund it is always their back until proven otherwise. I had years before stood on the other side of the exam table with their other Dachshund, Harley, when he had back pain secondary to intervertebral disc disease, and progressive paralysis. There comes a point in this disease when it progresses fast enough or far enough that surgery or a humane goodbye become the two options. I saw the bottle of euthanasia out of the corner of my eye while we discussed the options. My father hadn’t handled it well and was reliving goodbyes from years ago and was essentially distant from any reasonable discussion and my mother held the weight of the decision on her shoulders. While Harley’s body was failing him his brain was very much intact and aware of his distraught owners. They had elected to drive all night for imaging and surgery. Harley walked again but now how has neurologic deficits and was never 100% normal again. Now it was Abby, their other Dachshund. They had been down this heartbreaking and difficult road before. It was decided that we could try what we could here but the option of referral and surgery just wouldn’t be available. Abby had been on a variety of pain medications including a Fentanyl patch but nothing was touching her pain. She was even sedated for radiographs and bit me as I was trying to touch her. The happy little dog at your feet just waiting for a crumb to drop had transformed into a screaming painful feral creature. We breed these lovable little dogs for their long backs but with that comes the risk of instability of the discs between the vertebrae. They can bulge and burst, pushing on the spine or nerves, causing unbearable pain or even complete paralysis. I started a morphine/lidocaine/ketamine continuous rate infusion and intermittently just sedated her to facilitate her pain. I brought her home and kept her by my bed in a tote. The Kiddo peeked into the tote and with concerned eyes asked if she would need to go to puppy heaven. My heart ached. It had been two days and I couldn’t touch her without the screaming and biting and she had progressed with motor loss on her left hind. The bulging vertebral disc was pushing on spinal nerves and her spinal cord, causing pain and loss of function. First it is conscious proprioception…knowing where your feet are…then paralysis…then superficial pain…and then at the end there is no pain sensation left at all. We made the decision to pick up the “supplies” that would be needed to end it all…the strong sedation and thick blue syrup that would stop all her earthly pain, but open up a pain for those that knew and loved her. It is emotionally tasking to watch pain in an animal knowing they can’t communicate if it is all too much or they are willing to keep going. I had stopped her MLK drip, continuing her other pain meds, with the decision that if she couldn’t maintain comfort without it, it was unfair to continue. I continued her therapy exercises, hoping and praying those little neural pathways would be stimulated, that the unstable disc would stop its pathway to paralysis. I stimulated her toes, did bicycle motions, stretches, massages, even took a electric toothbrush to her toes to stimulate her nervous system. With clients there are lots of words and discussion, the knowing when, the hows, the questions. With my own family I found it harder to find the words. When someone has know you your entire life, they can read your face, your ticks, your eyes, and hear the words unsaid. So much of the discussion wasn’t a discussion at all but a knowing. I wanted to make the right decision for Abby. The bag of “supplies” lie on my vehicle’s floor board and as we drove home my mind spun, dreading the moment, trying to push the details out of my mind. I felt frustrated that it had come to this. Should I have ended the pain sooner? Should I hold on for a miracle? I peeked into the tote and Abby was bright, alert, more upbeat than I had seen her. The test would be could I pick her up without the screaming. I could and she even wanted to eat something. Could 5 hours have brought a miracle, a turning point? I knew the drugs would affect her and cause her to be dysphoric but I hadn’t expected her pain to be controlled without them. I texted an update and said let’s give her more time. Thru the weekend she was able to start moving, placing her left hind leg that previously was worthless. I did her sessions at least 3 times a day…stretching, massaging, stimulating, hoping. A new day came and her appetite improved, her attitude improved, her function improved. Had the suffering she endured been worth it to get to this point? We added acupuncture and continued laser treatments and she went home with my parents yesterday. Is she out of the clear…I don’t know. Will she ever be 100% normal…I don’t know. She has chronic changes that will probably always be a risk…and lead to a relapse. But at least we have hope, though prepared for what may be. Was her suffering selfish? Maybe. Was her suffering worth it if she can recover to enjoy another day? I look back and say yes now. This isn’t the first time I was disheartened, preparing for the worst, wondering if we humans were selfishly keeping a patient alive for our own purposes, only to be amazed at the recovery that can be made. I have literally had the euthanasia solution in hand walking to the exam room when the owner cried out the door “He tried to walk!! !” The paralyzed HBC (hit by car) dog had pulled himself to his unsteady feet after no improvement while hospitalized and there were simply no more financial resources to continue the effort. He made that first step and didn’t look back making a near full recovery. As a new vet it was a powerful lesson about making that decision for our pets which we do from a place of love and concern for their suffering, but sometimes they decide it just isn’t time and want to keep fighting. I am forever amazed at the healing and recovery possible. *Update on Abby. She had some regressions with her rehab and became a somewhat difficult patient. She has since been staying with me to continue her exercises and monitor her recovery. She is still periodically weak in the back end and mis-steps occasional. While she may never be 100%, we are hopefully she will recover to enjoy more quality time, with her pain controlled. Her spirit is definitely back. I didn’t physically grow up on a farm or ranch but I wasn’t too far removed from the life. We are still very rural where small talk centers on the weather and cattle or wheat prices. 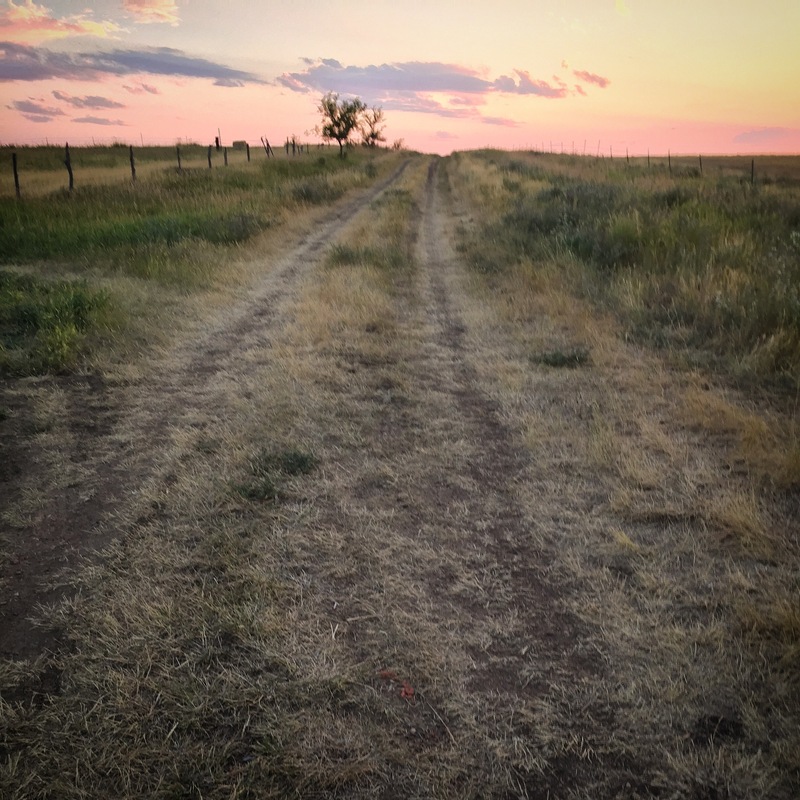 So now I am a rancher’s wife and the world I thought I knew is the world I am learning. Haying season is in full swing and it very much a goldilocks situation of too much…too little…and always hoping for just right. This year the July air is dry and hot, with record-setting heat in the triple digits this last week. The evening thunderstorms roll in bringing noise and lightening but no rain will let loose from the darkened clouds. We are in a drought. The grass in the hay fields that was once green and lush, set to grow and be harvested for cattle feed when the winter snow fell, is brown and dormant. Crops that were meant to be harvested have just failed and instead are being hayed and salvaged for cattle feed. The pastures that were meant to last the season are dry and barren and producers are creatively scrambling to find feed and grass for the cattle. Many cattle been taken down the road to the sale barn with producers hoping to make due with a smaller herd forced by this new reality. The dry and crisp grass remaining on the prairies have served as kindle to area fires. 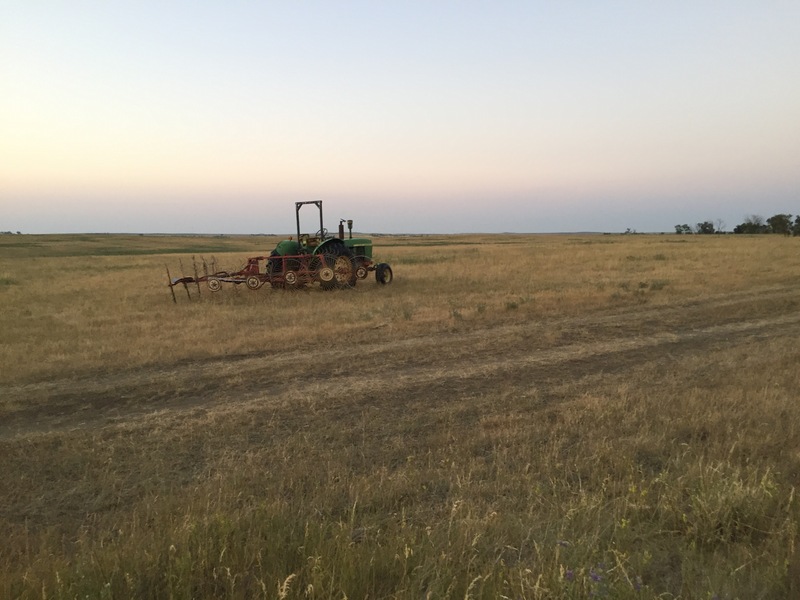 The work still needs done… even though the grass is 1/2 to a 1/3 of the what a normal year brings it still needs to be cut, raked, and baled. The equipment still costs what it costs, the fuel to run it no less, and the breakdowns no less infrequent. My husband sleeps in the tractor waiting for the heat of the day to subside and the nightly dew to come and condition the hay. While the yield is low, there is still a need to produce the best that can be made. Too dry and the hay shatters, too wet and it molds. I get frustrated with his long hours, inconsistencies, and no guarantee of a paycheck let alone a break even. Though hard work has its place, some days it seems you are just about as guaranteed to become bankrupt as you are to become rich at this gig. Sometimes it just comes down to the goldilocks situation…just enough demand for the product produced ensuring a strong market… good weather….no major breakdowns or expenses…and a blessing from above. 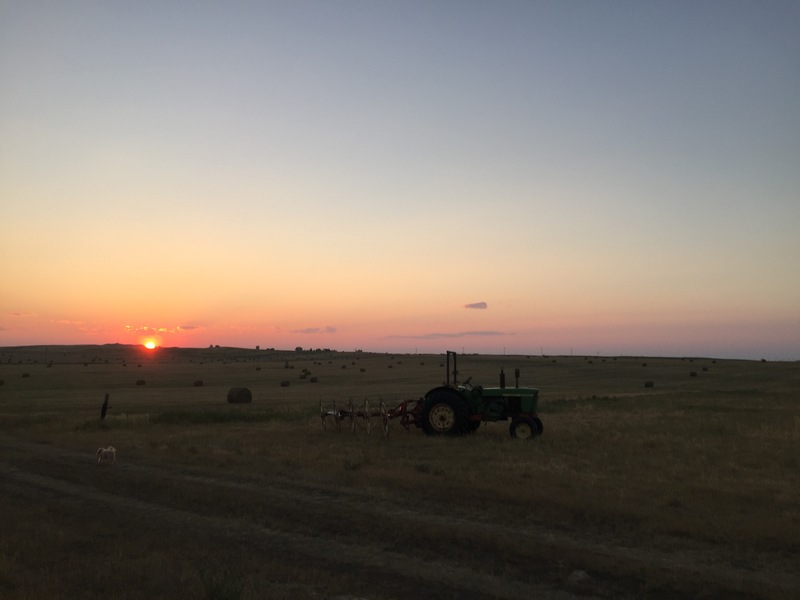 In a world we try to control, farmers and ranchers are the ultimate believers…believers in a merciful God that provides, in neighbors to help, and that their hard work will be enough. I see my husband’s heart and soul poured into a career with no guarantee, no median annual salary, no paid vacation days all with the belief that his hard work will be enough to “make it”. When training dogs they call it “jackpotting”. The idea of giving a large amount of a reward when the desired response is done…but not every time. There has to be anticipation for that jackpot. The theory is much the same for gamblers. They sit and wait for that one “hit” of the machine. Maybe farmers and ranchers are the same. I sit and worry, ponder a future I can’t predict while the older generation talks of the good years and the not-so-great years. They all talk of the great year…the market high, when there was “just enough” of all the resources they needed. That one great year carries them thru the not so great. They ride out the bad in the hopes of averages…that when it is all said and done and the book cover closes that they will be ahead. 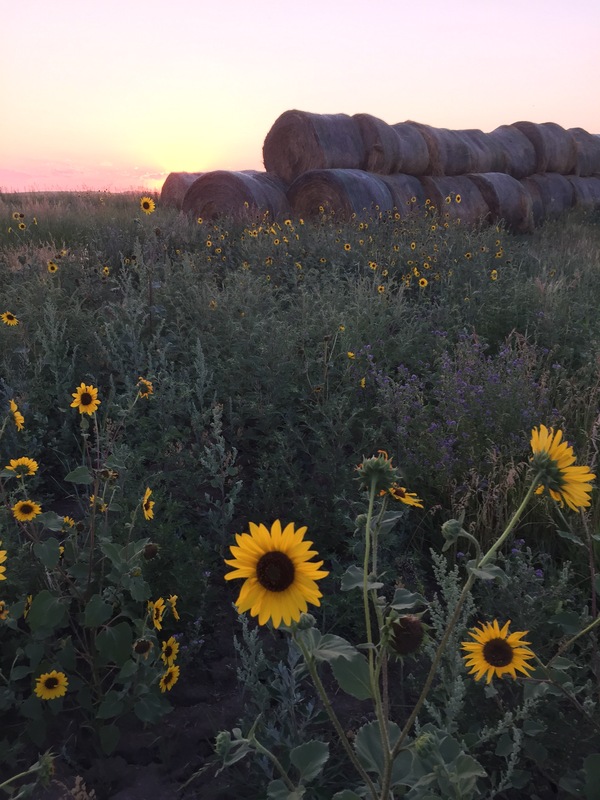 I know it is just part of the cycle…these farmers and ranchers are very in tune to cycles…hopeful and optimistic for the ups and patient and tolerant of the downs. I have a lot to learn from this group of folks…to look at seasons and cycles and take it as a whole not a day. 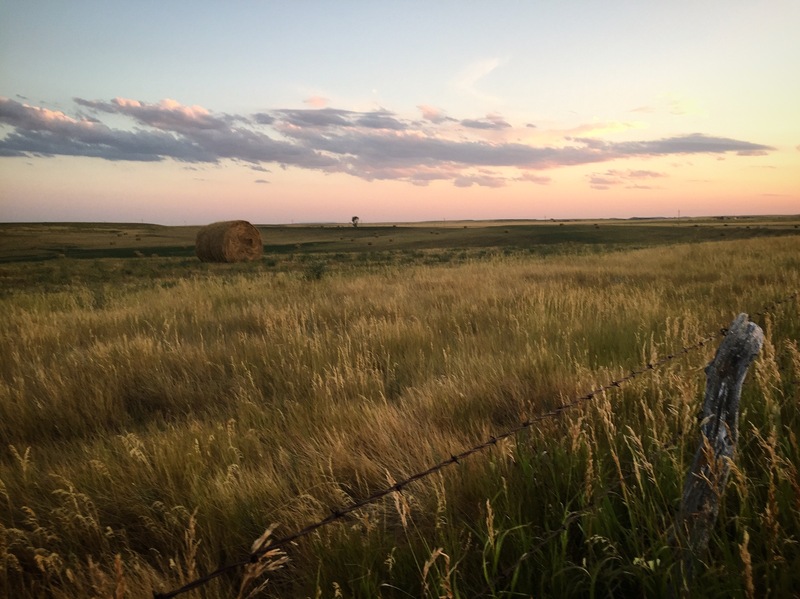 These ranchers gather, arms crossed and leaning around the back of a pickup box to shoot the breeze and discuss how to make it all work when the world seems against success. Yet there is a perpettual optimism. As humans, we all want control…to make our own decisions…be in control of our own destiny…yet here is this group of farmers and ranchers so OK to accept their fate, their hand dealt. We can’t control the weather. I can’t make those ominious clouds that come and go finally let go of any moisture. But I can live and learn, take pride in the work my family has choosen to do. I can’t speak for my husband but I know he isn’t motivated by a paycheck or pride, but with the quiet purpose of a life well lived, enjoying and sharing a legacy, with reverence for the land and its history. “I was a perfect parent until I had kids” starts many a story in my life. I laughed at the thought of baby harnesses and leashes. What type of parent needs a leash to control their kid when my Labrador can walk on a heel and has a pretty solid recall. Well apparently this parent needs one! The little one is a runner. To be fair I raise my kids like a raise my cows….free range! The joys of farm life are the freedom to run and explore while still understanding the dangers of animals with hooves, teeth, or beaks and of the risks of large equipment with poor visibility going thru the yard, that balance of promoting exploration while wanting to swarm over them as the anxious helicopter parent. I admitted the problem after our family vacation. There are about 10 ways to die for every mile in Yellowstone National Park so we had some serious talks on safety. That being said the 1 year old was determined to see just how serious we were. Every board walk required he be tightly held for fear he bolt off into certain horror. Every hike he found the “edge” of the trial and if there wasn’t an edge he tried to climb the rock walls. I turned to Amazon for options for safety harness or hand cuffs to force him be by my side…if they can deliver to middle of nowhere ND maybe I could set up a delivery for Old Faithful! We all survived the trip (even after the little one took off after a rabbit in the camp ground like a frenzied wild hound dog!). But we had a problem. We had successfully taught the concept of “range” and “recall” to our dogs so how hard can this be right. He is an intelligent, communicative toddler…but with a clear mind of his own desires and ambitions! We worked on emergency stops and recalls as a “game”. Turns out cheese cubes make a nice reward treat for young dogs and kids in training (Mother of the Year I know). We discussed consequences and safety as much as you can to a 1 year old. Then the other day the little adventurer slipped between two corral panels just 4 inches wide, luckily into an empty corral. I found a cow halter and fashioned a leash…yup I did it! I leashed my child for his own safety! This is a problem. A few evenings ago we were enjoying one of those free range evenings when I thought I would test the little one. Maybe he was just testing me so I hid behind a tree while he wandered ahead. He turned his little blond head and uttered a “Mama?” realizing I wasn’t following behind. Then newly aware of his freedom, he promptly found a new gear and headed off with dust rising from his little cowboy boots to the chicken coop. How can something with such little legs be so dang fast? Just like we taught the new puppy to enjoy a “collar grab” in the event we need to quickly restrain him maybe we should do the same for the little one and fit him with a baby restraint handle. The final test came when we headed into town. Town brings its own unique safety dangers…namely cars! The rules are clear…no roads, stay on grass. No bolting and stay with an adult. So of course the little one bolted. I stayed back to see if he was testing and this only resulted in my having a undeniable handicap in our race to freedom. My shoe-less feet hit the steaming hot payment and I envisioned those zen persons walking on hot coals to prove their inner peace and here I was running on hot asphalt to prove my worth or dis-worth as it was as a mother! I envisioned the road being lined with fresh lined baking sheets and I mind over matter chased “The Bolter”. Then I hit the dry crisp brush and weeds…my feet were screaming at me so I called for help, like there may have been a shoed super hero nearby that would swoop in to collect my unruly toddler. My mind quickly surveyed for danger… a child-hating dog could soon emerge from a home, the black bird flying over was probably a hawk ready to swoop in and carry him off, and of course for CARS! Dangerous speeding cars! I had failed as a mother as he ran faster and faster while I was perishing on our own version of parental “Survivor”. He was making a large circle and I was rounding the corner. I parked bike caught his attention and I used this distraction to gain some ground, screaming “Stop” and “No”. In hind sight when my dogs had taken off I had most luck running the opposite direction screaming “Who wants a treat? !” so apparently my mind didn’t translate that into a parental version. Then came the broken glass part of this feet on fire motherhood walk. Why had I not had shoes on?! One must always be prepared for emergencies like a run away. I finally swooped him up and gathered him in my arms only to have him protest, squirming and fussing. I didn’t know wether to have flames of fiery rise from my head or tears of joy that it ended with no harm. We limped back to the house and I nursed my wounded soles, pulling slivers and scraping the pieces of tar and gravel from my heels. I had read in our dog training books no off-leash activity until your dog is solidly recalling and can be safely and reliably trusted. So back to “training” we go. My children need to be self-aware of the dangers in their world and learn to take appropriate risks. They may just be doing it with their baby harnesses securely fastened and their long-lines in tow! 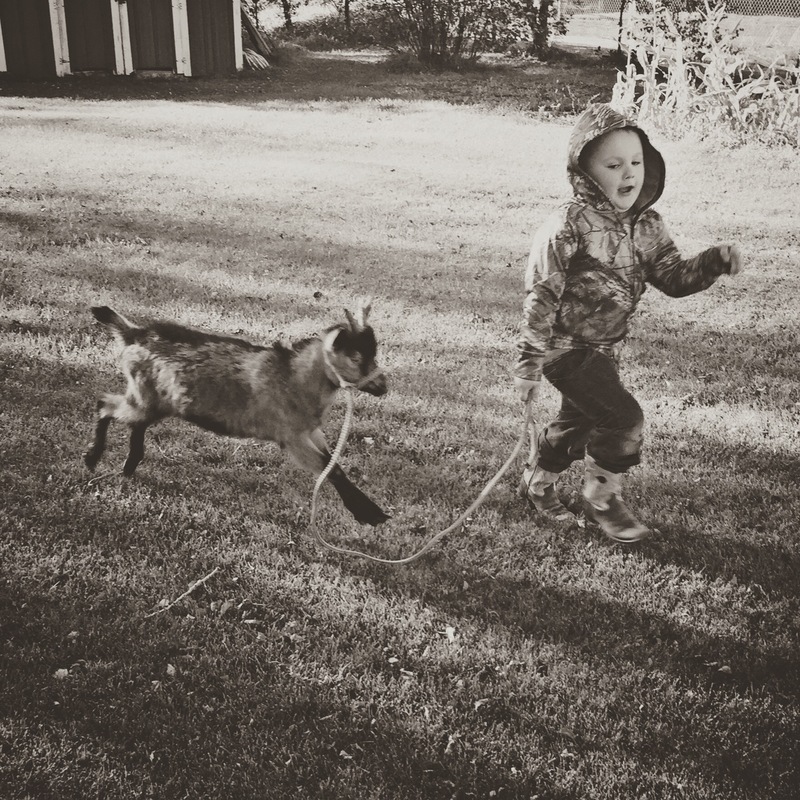 Thinking of a Pet Goat…here is why you need one! The kiddo and I begged and begged for a goat and scoured every classified hoping to find the “one”! 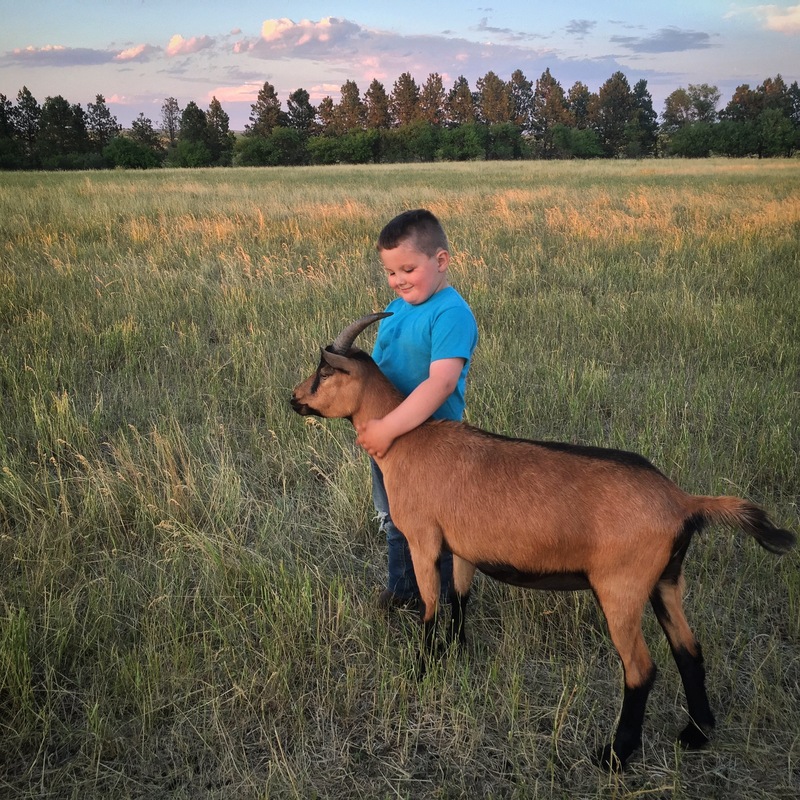 Seeing little utilitarian purpose for such a creature on a ranch, the Hubby quickly and repeatedly said “No!” The Kiddo and I knew our agenda for acquiring a goat would be challenging but not impossible. Last fall Kiddo and Hubby headed to the neighboring town to sell our lambs. They sat in the stands watching the animals go thru the sales ring. A group of good looking goats had just gone thru the ring. 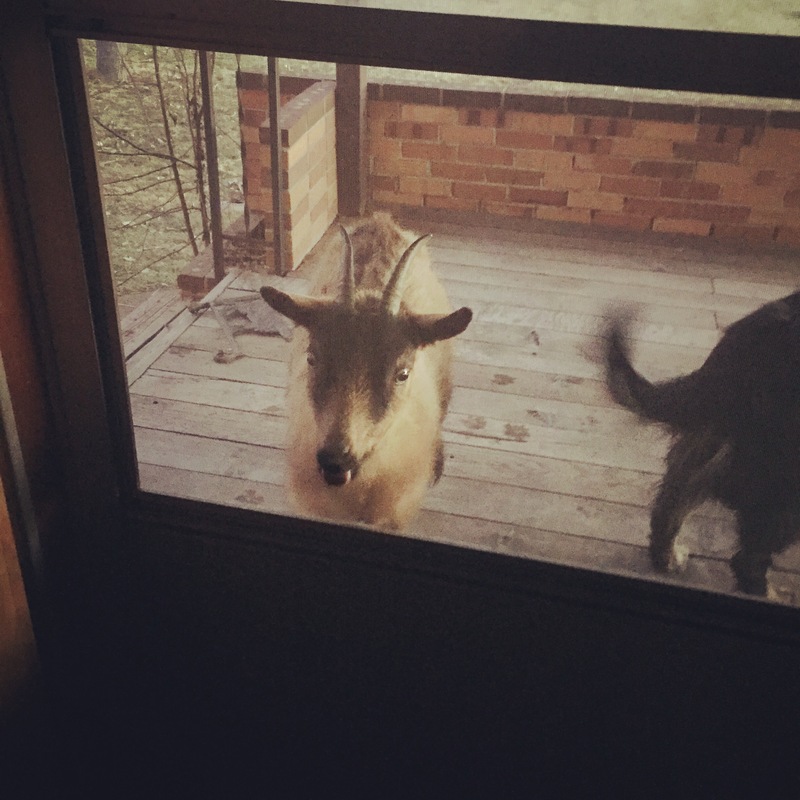 Then the door re-opened and in walked a little, friendly goat, matched in appearance, dark brown with black points, but half the size of the goats before her. Brad tells the story of how he saw this little goat and then and there told himself “Well, we are going home with a goat today.” He blames his “Dad Heart”. So up went the hands as the little goat followed the ringman, bleating for attention,. Clearly she was a former bottle baby, well accustomed to people. 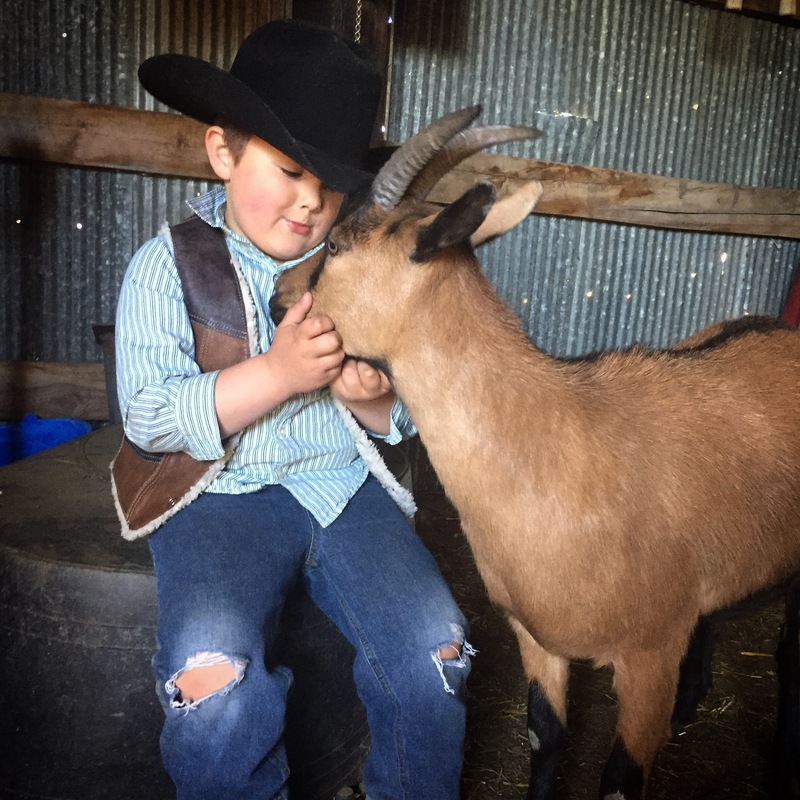 Another person started bidding against the Kiddo and the auctioneer stopped the bidding saying “Sorry folks, this little goat is going home with that young gentleman.” At that moment, for just $30 the Kiddo acquired himself a goat. I received the text picture with the beaming Kiddo and the Dad who clearly had thought with his heart and not his brain. The sales slip generally had a buyer number but for this little goat, the buyer number simply had my Kiddo’s name listed as the “Buyer Number”. 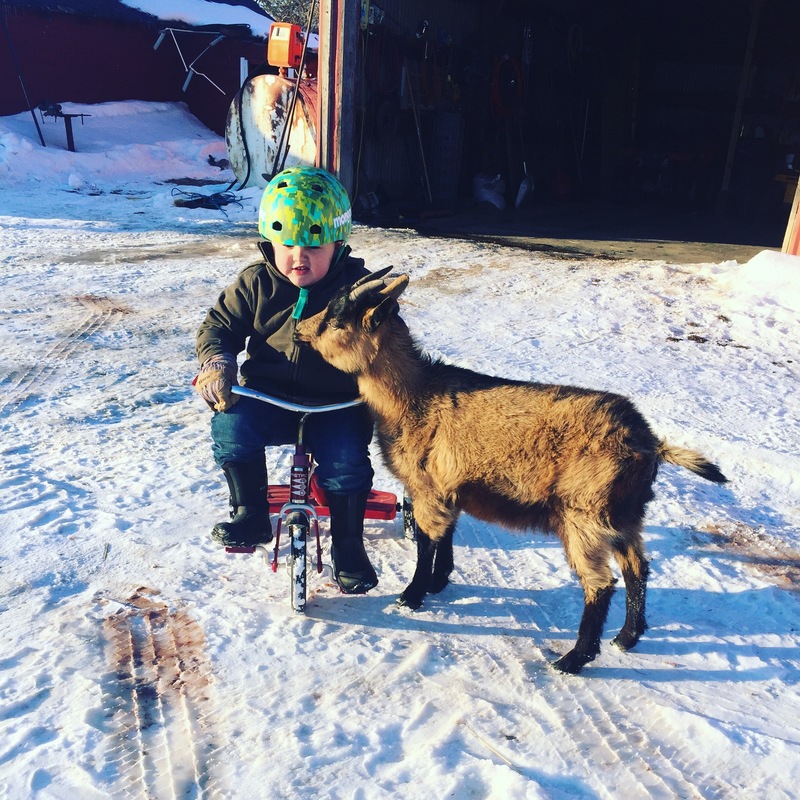 She has quickly become very bonded with her little person and it seems she is all our former dogs reincarnated in goat form, running with the 4-wheeler to the pastures and serving as the boys yard companion. The neighbor just chuckled, saying “Your dogs would be pissed if they knew they got replaced by a goat.” Ella, became her name because she looked like an Eland African animal though Ella is actually an Oberhasli dairy goat. She is comfortable to stay in the corral, bothering the heifers or visiting the horses, until she hears her boy outside. Ella then comes running to join in his adventures. 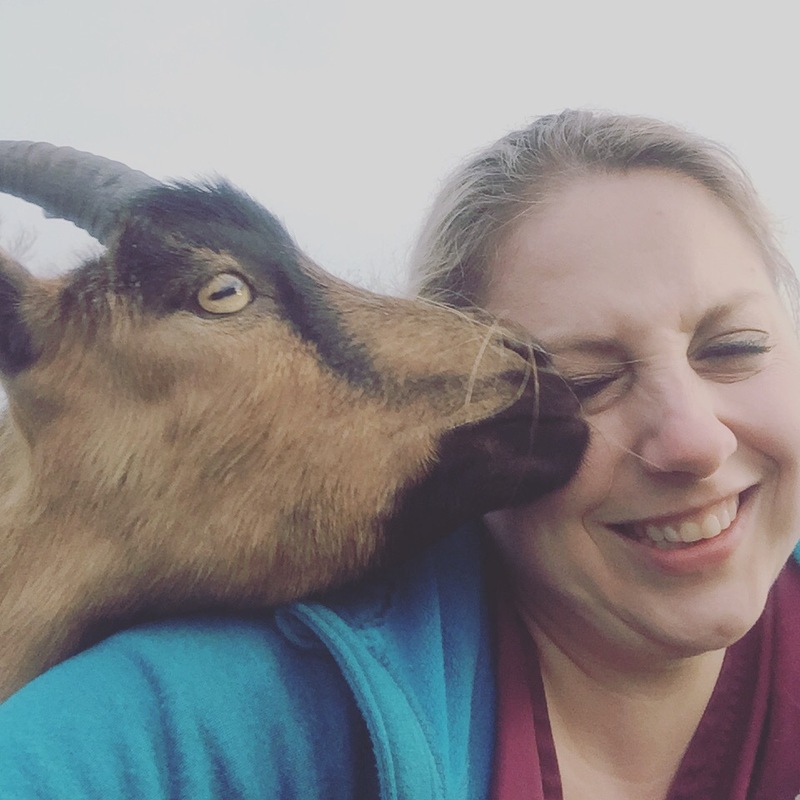 So here are our top reasons we have and kept a goat! No need to water flowers because you won’t have any. Flowers and other wonderful greenery are like salad containers for goats and what hasn’t eaten she simply ripped out roots and all. Delivery man are just about as taken aback by a goat running to their truck as a barking guard dog. She assaults the delivery trucks and men with over enthusiastic greetings and nosing for granola bars they had mistakingly shared before. We have to lock her up when the Schwan’s man comes as she tries to steal his food items as he removes them from the truck. Goat antics! 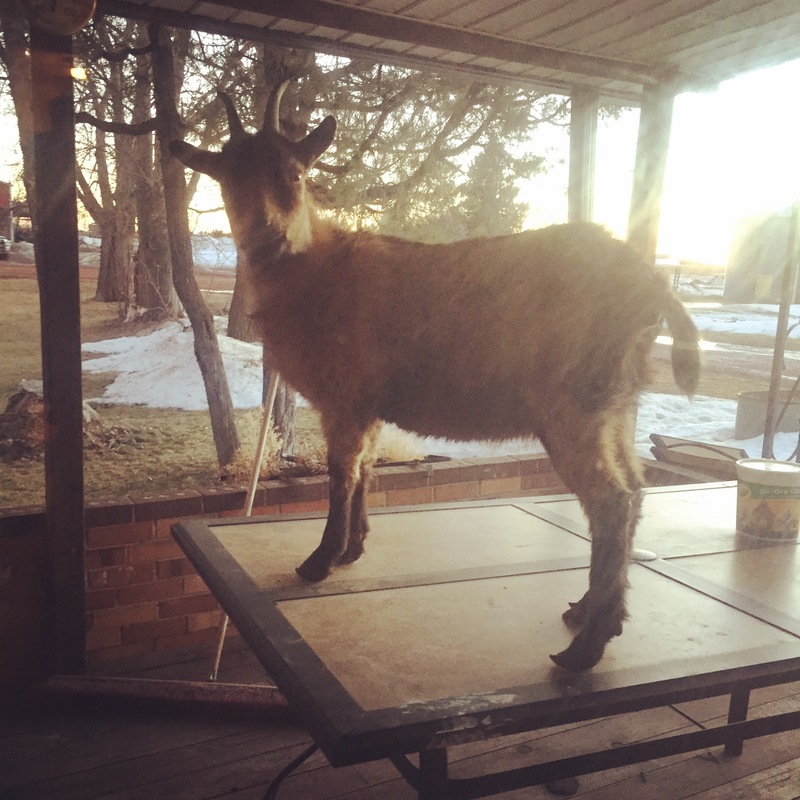 Nothing like watching our little Ella buck and run around the yard, though I would prefer if she didn’t use our patio table as a launching pad. She can be a regular “Butthead” as the Kiddo says. When the dogs have enough sense to not follow the Kiddo as he makes his 100th lap around the farm yard, she is a faithful side kick. Where the boy goes, the goat follows. Maybe someday she will be the pet that gives back with milk. 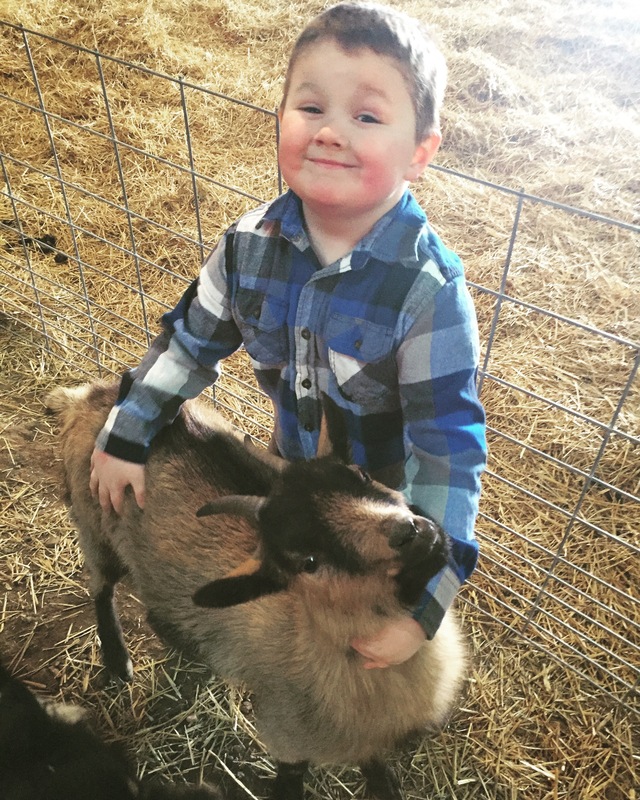 The hubby vows one goat is enough but the Kiddo and I have plans…shh! We may have to turn his “Dad Heart” back on for the possibility of Ella babies. Fencing is only a suggestion! If nothing grabs her attentions Ella is content to follow our suggestions of where she should stay. But she generally goes when and where she pleases. Last night she slept by our open window instead of in the barn or shelter that were her other options. The Hubby immediately knew the look that had crossed my face and replied “No she can’t stay in the house at night. She is a goat!”. You will finally kick your selfie habit! Ella has horns and I wish she didn’t but don’t have the heart to remove them now. That means that any close hugs near her face results in your face being in very close proximity to two very pointed and hard horns….that hurt even with mild contact. So no selfies…it isn’t worth the risk of facial trauma! Capricious means “given to whimsy, sometimes erratic” and derives from the word “caprine”. Caprine means goat! So there you have it…goats are these little whimsical, erratic creatures that do things on their own terms. Either you love ’em or you find ’em a giant pain in the rump! There was no raining on this parade. Though with our recent drought conditions a downpour would have likely been more celebratory than the parade itself. Yesterday we partook in our annual RoughRider Days Parade. Small town life is friendly waves and an enjoyment of days much the same as the last. But every year 4th of July brought a big celebration with rodeos, street dance, 4-H activities, fireworks, and parade. As was tradition, every year on that designated Saturday morning in July, we sat street side to see the local businesses parade down Villard, with hopes of filling our pockets with candy. Now I share that same tradition with my own kiddos. My sister and nephew. His 1st parade of many. There is an excitement and nostalgia. No float is really that extravagant. The only requirement it seems is a business banner and maybe some streamers or balloons. If you have a unicycle, old car, or vintage tractor your are welcome too. Suckers were his favorite! He picked up each and every one! It was quickly overflowing and they moved on to the next container. For years I carried flags horse back in the parade and my sister painted her face and placed on her clown nose to take her part in the parade. Those traditions continue. In the past, there was more of a celebration of our agriculture and western edge heritage. With the resurgence of oil in the area, the companies have brought prosperity and wealth to many in the area and they sponsor many local happenings. There addition to the parade demonstrates a changing time. It was a great Saturday enjoying our local community and celebrating with family! Happy 4th of July everyone! Anyone else take in a parade this year?